It was on September 13, 1944, when units of the 30th Infantry Division, of the US 1st Army, marched through Margraten, east from Maastricht, Holland, and headed for the Ruhr area. On this day, a four-year occupation by the Germans ended for the people in the south of Holland. During the fierce battles, a lot of American boys got killed. 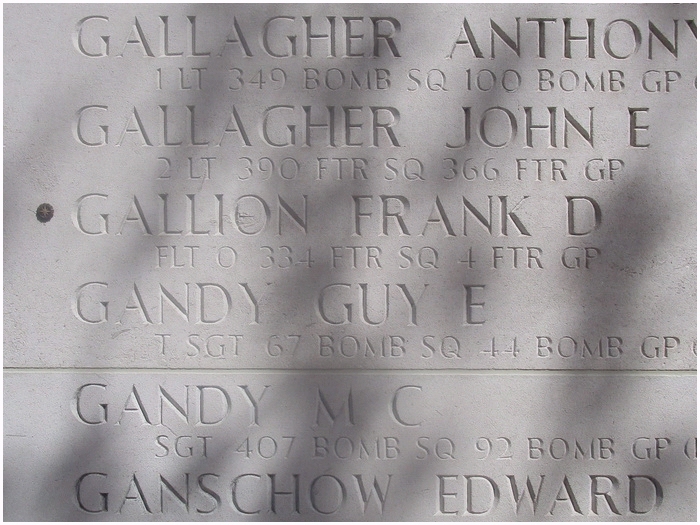 It was necessary to find a final resting-place in the area for these men. Near Margraten a cemetery was furnished where the first men were brought in on November the 10th, 1944. Not only the men that were killed in the Ruhr area, also the men who lost their life during Operation Market-Garden were buried here. When the 'Battle of the Bulge' broke out a month after the cemetery was in operation, a lot of American's were brought to Margraten. The 26 hectares was filled with the sorry sight of wooden crosses with the names of victims who fought a battle that would free Europe from Hitler's Third Reich. 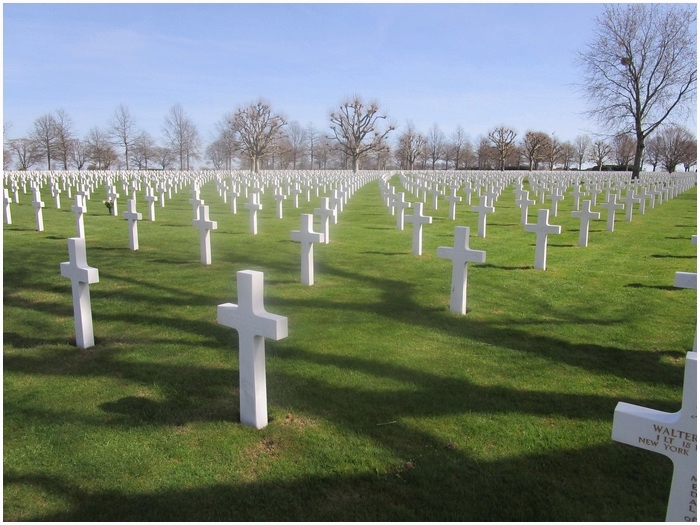 The Dutch government gave the ground to the American Battle Monuments Commission in loan indefinitely (ABMC). This organization, founded in 1923 and operating independent in service for the American government, is responsible for remembrance of the killed American's on foreign soil. The ABMC designs monuments, memorials and cemeteries. 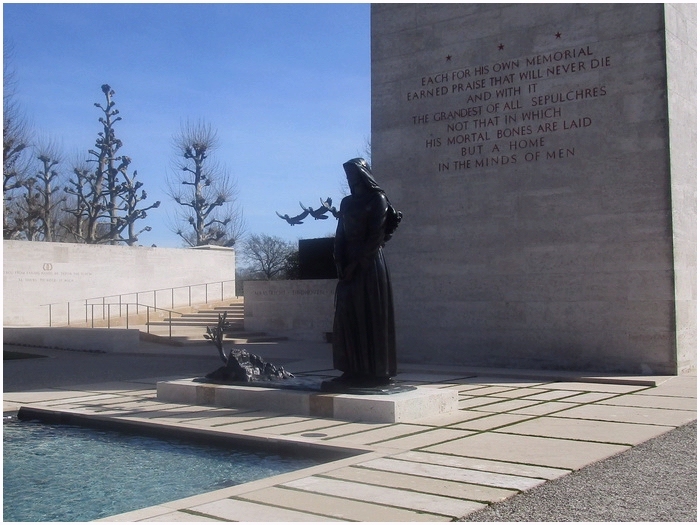 For Margraten, the architects Shepley, Bullfinch, Richardson & Abbott, from Boston, Massachusetts were invited to design the monuments and the cemetery. The bronze sculpture was designed by Joseph Kiselewski from New York (see picture above). 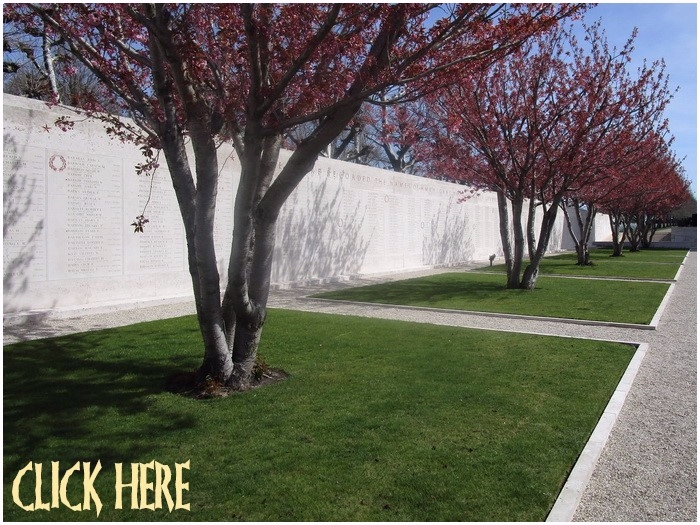 Clarke, Rapuano and Halleran were responsible for the landscape and garden layout. The cemetery of Margraten can be found on the N278, the road from Maastricht (after 12.5 km) to Aachen. It is open daily, between 09.00 and 17.00 hours, except on the 25th of December and the 1st of January. When you enter the grounds, you see on the right a visitorcenter, and on the left a covered area with large maps. 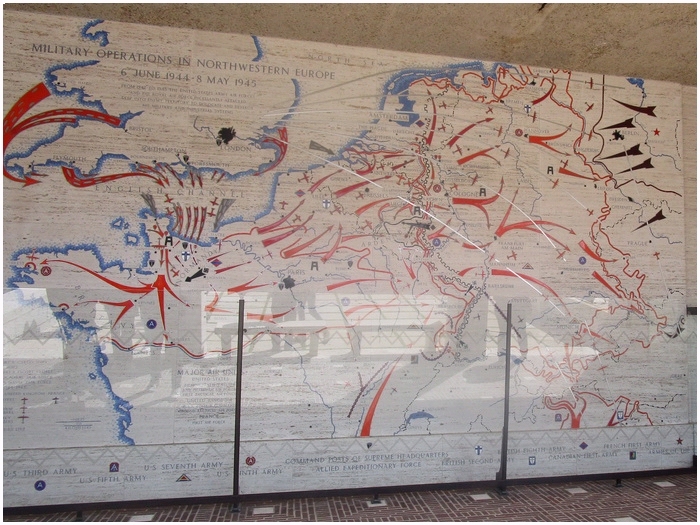 It depicts the frontlines during the war after June 6, 1944 (D-day). Also mentioned are the strategic attacks by the airforce from 1942 onward. The wall of the missing, the rosette besides private Archie Ketchum indicates that he is identified. Head for the large white tower. Left and right of the 'reflecting pool' are walls which contain 1722 names of the missing. At some names you may notice a small rosette, this indicates that the person is identified and no longer missing. You can imagine what a great relieve this is for the family. A lot of the memorials are sculptured from Roman travertine, a limestone that contains many fossils. A more than appropriate stone in this case. A bronze sculpture, a moaning figure beside a tree destructed by war, but with a new shoot, a new hope, and pigeons who bring peace, stands in front of the 30 meters high tower. 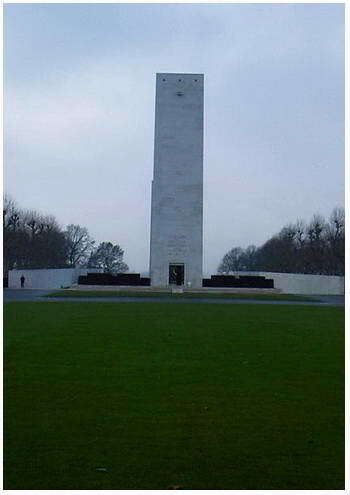 On both sides of the tower are walls with engravings of the area's where are American troops were fighting in the Second World War; Maastricht, Eindhoven, Grave, Nijmegen, Arnhem, Julich, Linnich, Geilenkirchen, Krefeld, Venlo, Rheinberg, Cologne, Wesel and Ruhr. The tower is built out of Portlandstone from England and has on the groundlevel a chapel. 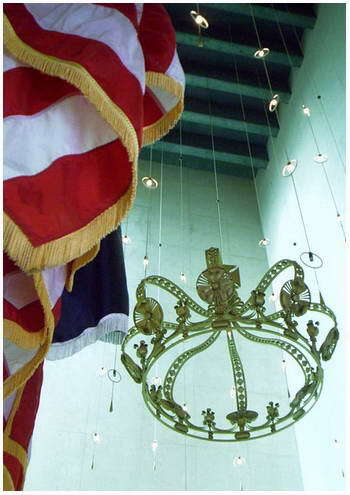 Within hangs a large crown from the ceiling, a gift from the Dutch people. Also from the ceiling shine lights, as stars from the sky. On the altar stands a silver bowl with the inscription 'Honor-Faith-Valor'. When you climb the 149 steps, you have a great view on the cemetery. 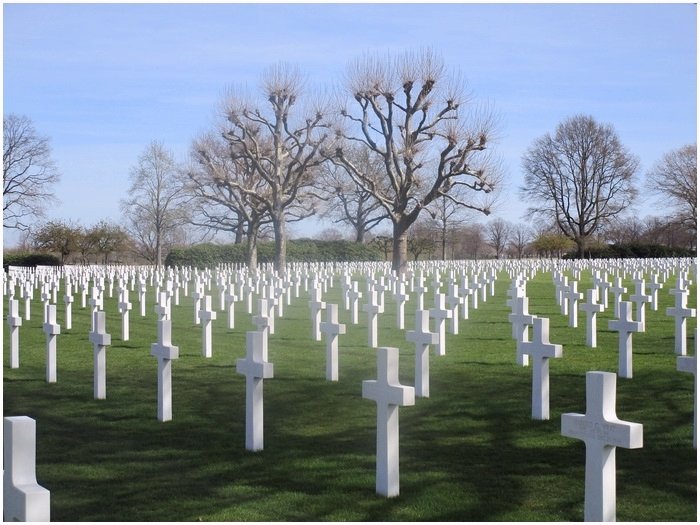 The fields of honor are divided in sixteen sections (running from A to P). In the sections are 8301 gravemarkers, with one grave that contains two unknown victims. There are further 106 stones that have no name. There are forty 'pairs' of brothers that lay beside each other. The last American that was buried at Margraten was Lt. Utecht, on September 16, 1994. It is possible to adopt a wargrave at Margraten (and other US cemeteries in Europe). The one who adoptes a grave does visit it at a regular base and places flowers as a token of gratitude towards the liberator who is buried so far from his native soil.